Farrucas Duo - holiday Monday @ Artfest Toronto! “Farrucas Duo” is a husband-and-wife duo that experiments with the diversity of Latin sounds and instruments through their music - painting an exotic musical portrait for you to enjoy all year long. Farrucas Duo’s artistic taste is a “fusion” between two musical traditions; Mediterranean and Ecuadorian, blending together other several genres including Arab, Cumbia, Rumba Flamenco, Salsa, and Rock influences. Jorge: “I am a self-taught musician. Since 1990, I’ve joined and performed with various folklore groups, recorded an album with Raíces – a group from my Native city (Ibarra, Ecuador), and later on I became a part of The Imbayakunas – completing with them their 2003 tour… In context to how he met my wife, I bonded with her musically, as well as sentimentally. In 2005, we both returned to Ecuador, South America and on October 8, 2005 our musical bond officially formed “Farrucas”. Posted on September 1, 2018 by Lory MacDonald and filed under Artfest Music and tagged Farrucas Duo Artfest Toronto Distillery Artfest Music Live Music. Melody Fair tomorrow at Artfest Toronto at the Distillery! Tomorrow (Sunday) at Artfest Toronto, join Melody Fair joins with their beautiful guitar rhythms and sweet melodies. David Wipper has a solid background in recording and concert performance. You will recognize his distinctive style from Grammy Award winning hit song Black Velvet and other hits by Amanda Marshall, Rita Coolidge and Return Trip. Hazel Wipper hails from folk band Jesse and later the Decades and sings gorgeous lead with her partner David in Melody Fair. They perform a wide range of folk and rock classics showcasing David’s stellar guitar skills and Hazel’s amazing voice. Artfest Toronto hosts two outdoor art and craft shows. Celebrating painting, photography, sculpture, fine craft, live music and more from Canada’s top artists. Set throughout the cobblestone lanes of the Distillery Historic District in downtown Toronto. FREE admission. Posted on September 1, 2018 by Lory MacDonald and filed under Artfest Music and tagged Artfest Music Artfest Melody Fair Distillery Art Show. RUN DPC performing @ Artfest Toronto at the Distillery! Mike Jones and Andrew Hild are local musicians who hail from Toronto Island where there is a rich history of great musicians, artists and actors throughout the community. We are very excited to get this talented duo off the island to perform at Artfest Toronto at the Distillery! They have a wide range of tunes to share including their original compositions so drop over to the main stage at the Disillery District this Labour day long weekend and get your groove on with RUN DPC! From Aug 31st to Sept 3rd - come and celebrate fine art and craft and rockin' music! Performing Saturday, Sept 1st - on the main stage - check RUN DPC out! Artfest Toronto hosts two outdoor art and craft shows. Celebrating painting, photography, sculpture, fine craft, live music and more from Canada’s top artists, Artfest is set throughout the cobblestone lanes of the Distillery Historic District in downtown Toronto. FREE admission. Posted on August 30, 2018 by Lory MacDonald and filed under Artfest Music and tagged Artfest Music RUN DPC Disillery District Artfest Live Music. Don Stevenson & Fergus Hambleton @ Artfest Toronto! Get your groove on with Don Stevenson & Fergus Hambleton while they open the stage and welcome Artfest visitors from far and near this Labour day long weekend! Drop by the main stage this Friday at the one and only, Distillery Historic District in downtown Toronto! A Juno award winning musician, multi-talented singer, songwriter Ferugus Hamleton will be joined by founding member of the legendary Moby Grape Band, Don Stevenson. Providing musical entertainment August 31st at Artfest Toronto in the Distillery District - this is an art event not to be missed! Fergus Hambleton is a versatile singer, songwriter, composer and multi-instrumentalist who, during his illustrious career, has been a leading performer and songwriter in the folk, pop and reggae music arenas. Fronting the Juno Award winning reggae outfit, The Sattalites and enjoying a successful solo career are among his many musical achievements. Don Stevenson is known world-wide as the drummer and singer/cheif songwriter for Moby Grape, a band which was formed in San Francisco in 1966. In 2003, the disc was ranked as number 121 on Rolling Stone magazine’s list of the best-ever 500 albums. All of Moby Grapes five members went on to make their own music or join other bands, though it wasn’t until 2010 that Stevenson finally released a solo record, King of the Fools, which has had excellent reviews. Read about Don here in Talking with drummer/singer/songwriter. Posted on August 30, 2018 by Lory MacDonald and filed under Artfest Music and tagged Artfest Toronto Artfest Music Distillery Fergus Hambleton Don Stevenson. Get ready to ROCK @ Artfest Toronto! Artfest events always present a collection of rockin' performances by talented musicians to enhance the inviting atmosphere for Artfest visitors. We keep the music low-key so not to overpower the art scene, but instead, engage visitors making your visit with us quite memorable. Live music at Artfest Toronto is a lovely experience. Listen to tunes while you stroll around the show - 12pm-6pm, daily. Posted on August 19, 2018 by Lory MacDonald and filed under Artfest Music and tagged Artfest Music Don Stevenson Run DPC Melody Fair Farrucas. Rob is back in town visiting from Nashville for the weekend. Artfest welcomes Rob back to perform with local musician Gary Trainer and friends. This Canada Day long weekend at Artfest Kingston 2018, put on your dancing shoes and sing along with Full Circle. Their terrific harmonies and cool take on upbeat songs will have you saying “I love this song," and put a smile on your face. NEW to Artfest, we welcome this group and invite you to soak up their cool tunes and warm vibes - you'll be sure to have a groovin' time! The band will be performing Monday, July 2nd from 2:30 to 6pm on the main stage at the Food and Beer Tent. David has a solid background in recording and concert performance. You can hear his distinctive style on the Grammy Award winning hit song Black Velvet, and many others. Recording highlights include: Alannah Myles (platinum), Amanda Marshall (platinum), Dan Hill (Platinum), Rita Coolidge, Lulu, Marc Jordan, Robert Priest, country artist Sarah Smith, Voice, Strings & Melody Fair. Sherri has performed solo and with various groups as lead and harmony vocals and rhythm guitar over the past 30 years. Most recently she headed String Theory and The Ecclectix, and developed a loyal following in the Georgian Bay area. She is the founder and director of an independent elementary school focused on music and the arts. Haze began singing in folk festivals with Jesse, placing second in an Ontario-wide contest. She and David gained public acclaim in Toronto with The Decades. Hazel is also the vocalist for VoiceStrings and Melody Fair. Glenn has played bass with many groups over the years, from jazz to pop, classic rock and blues. Most recently, he worked with acclaimed bands String Theory and The Ecclectix. Glenn brings a solid groove to Full Circle's classic hit list. Posted on June 19, 2018 by Lory MacDonald and filed under Artfest Music and tagged Artfest Music Artfest Kingston Canada Day City Park Live Music. Julia Finnegan's heartfelt original music is influenced by legends such as Bob Dylan and Joni Mitchell. She garners inspiration from the works of Amy Winehouse, Sarah Harmer, and Brandi Carlile, to name a few. Although influenced by these great musicians Julia's sound is unique. Her heartfelt lyrics are poignant, clever, and thoughtful. Billy Lyte is an acoustic guitar player from Collingwood, ON who is influenced by the best folk and country music of yesterday and today. Lyte’s set list aims to appeal to many, playing songs that are fun and memorable. Lyte’s captivating combination of blues harmonica with rockabilly guitar moves works to provide non-stop entertainment. The Meringues (Kingston, ON) are known for their high energy and often catastrophic stage-performances. Sometimes crowd members can't tell if Ted and Amanda are a fighting couple who's completely lost it on stage, or if it's just part of the show. Drawing influence from bands like July Talk, Dear Rouge, and the Beaches, The Meringues are always working on bringing new and exciting visual aspects to their performances. On-stage, their antics and energy win over audiences immediately. In studio, they strive to capture the raw emotion and chaos displayed in their live-shows. From Funk to Romance! Having collectively shared the stage with great bands like the The Guess Who, The Tragically Hip, April Wine and many more, Artfest is excited to announce that the versatile band, Trilogy, will be performing this Canada Day long weekend at our Artfest Kingston show. It has become one of the most sought after shows throughout Ontario. Audiences everywhere are loving Trilogy’s inclusion of a full set of number one hits from the 70’s & 80’s, straight from The Great Canadian Songbook. These three well respected, multi-talented, top music industry professionals blend their talents to faithfully and accurately reproduce the sound of the artists they pay homage to. From James Brown’s funk, to the heart tugging Angel Eyes by Jeff Healey, Trilogy has an unfaltering professionalism so be sure to check them out at the show. Posted on June 19, 2018 by Lory MacDonald and filed under Other, Artfest Music and tagged Artfest Music Artfest Kingston Canada Day Live Music Art Show. Artfest Kingston kicks off the show with live music all weekend long. Join us on Saturday, June 30, 2018, with a father and son duo performance of Euphonium duets by Al and Alex Hearn from 11am-11:20am. 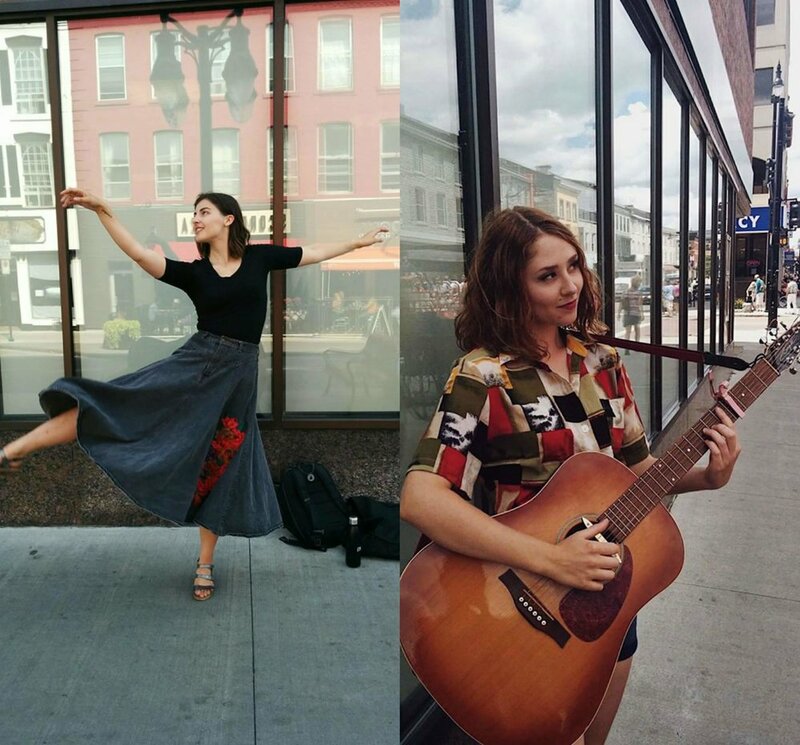 SAPPH DECAF is a new musical duo that's been charming Kingston, Ontario with their retro acoustic vibe and light-hearted banter since June 2017. Catch their two-part harmonies at Artfest Kingston. Posted on June 19, 2018 by Lory MacDonald and filed under Artfest Music and tagged Artfest Music Artfest Kingston Kingston Canada Day. Artfest events always present performances by wonderful musicians to enhance the great atmosphere for visitors. We keep the music low-key so it doesn’t overpower the art scene, yet engaging to make your time with us a rockin' good time. The show opens Saturday with Andy Griffiths and his energetic and passionate rootsy-folkin' rock tunes. Listen to his hit Running on Empty and get ready for a memorable performance at Artfest Toronto this Victoria Day long weekend. Andy Griffiths at Artfest Toronto! ANDY is an energetic rootsy folkin' rock singer/songwriter who writes from gut feelings and personal experiences. He sings lead and plays a driving rhythmic/percussive style on acoustic guitar. Catchy melodies and tight vocal harmonies are prevalent throughout his tunes. Check him out at Artfest Toronto. Andy produced a children's album (Andy Griffiths Songs for Children). To listen to his children's hit, Sandwiches, click here. Join the talented duo, Melody Fair, as they present their collection of beautiful guitar rhythms and sweet melodies. David Wipper has a solid background in recording and concert performance. You will recognize his distinctive style from Grammy Award winning hit song Black Velvet and other hits by Amanda Marshall, Rita Coolidge and Return Trip. Hazel Wipper hails from folk band Jesse and later the Decades and sings gorgeous lead with her partner David in Melody Fair. They perform a wide range of folk and rock classics showcasing David’s stellar guitar skills and Hazel’s amazing voice. Tim Bovaconti & Patrick Allcock will be groovin' on the stage this Victoria Day! Join us at Artfest Toronto all day long on Sunday, May 20th - to listen to Tim Bovaconti and Patrick Allcock. Tim Bovaconti is lead guitarist with Burton Cummings and Ron Sexsmith as well as an artist/producer in his own right. Patrick Allcock is a songwriter and musician. 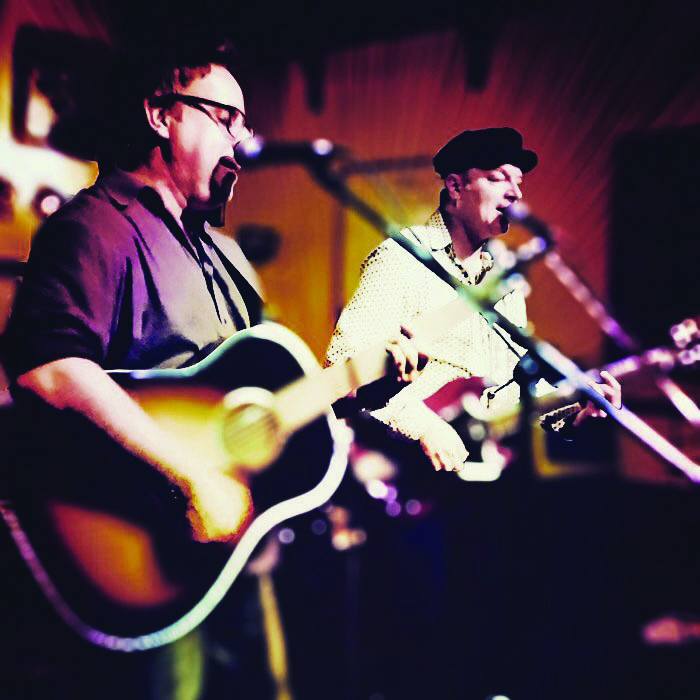 Tim and Pat have been sharing the stage for almost two decades in the Toronto area, as a duo or with a full band. They are well known for their harmonies and musical sense of fun, playing classic tunes (But, not always the most obvious choices!) and always providing a good time! Posted on May 1, 2018 by Lory MacDonald and filed under Artfest Music and tagged Artfest Toronto Artfest Music Tim Bovaconti Patrcik Allcock Melody Fair Andy Griffiths. Melody Fair performing TODAY at Artfest Toronto! All day long be entertained by Melody Fair: a dynamic duo who are set to perform a varied selection of your favourite tunes. They are fantastic, friendly and extremely talented! You won't want to miss seeing them entertain our Artfest Toronto crowds. Today, from 11-6, get your groove on and head over for some rockin' tunes! Dave Wipper & Hazel Wipper - have been performing most of their lives. The couple are happily Continuing on with music as their sole career,! The energetic, talented couple, will perform a wide variety of tunes at Artfest Toronto this Labour Day long weekend. Find them on the main stage in Trinity Square at the Distillery and HEAR THE EXPERIENCE!. Dave Wipper has a solid background in recording and concert performance. You can hear his distinctive style on the Grammy Award winning hit song Black Velvet and other hits by Amanda Marshal, Rita Coolidge and Return Trip. Hazel hails from the folk band, Jesse, and later, Decades. "Haze" gained public acclaim in Toronto with the Decades 60's cover band and is now the lead vocalist for Return Trip. She sings gorgeous lead and harmony with her partner Dave in their duo, Melody Fair. Posted on September 2, 2017 by Lory MacDonald and filed under Artfest Music and tagged Artfest Music Melody Fair Artfest Toronto Distillery. Lead Guitarist from Burton Cummings at Artfest Toronto TODAY! Join us at Artfest Toronto with performer, Tim Bovaconti and friends who will be groovin’ all day long at the historic Trinity Square in the heart of the Distillery District. Tim Bovaconti is lead guitarist with Burton Cummings and Ron Sexsmith as well as an artist/producer in his own right. Tim will be sharing the stage with musical friends from the Toronto area. They are well known for their harmonies and musical sense of fun, playing classic tunes and always providing a good time! Posted on September 1, 2017 by Lory MacDonald and filed under Artfest Music and tagged Tim Bovaconti Artfest Music Artfest Toronto Distillery. Artfest Toronto presents live music all weekend long! Live music at Artfest Toronto is a lovely experience. Listen to tunes while you stroll around the show and walk the cobblestone streets at the Distillery Historic District in downtown Toronto this Labour Day long weekend. All of our Artfest events feature live performances by wonderful musicians to enhance the atmosphere while setting the perfect ambiance for visitors. We keep the music low-key so not to overpower the art scene, yet engaging to make your time with us more entertaining. Posted on August 29, 2017 by Lory MacDonald and filed under Artfest Music and tagged Artfest Music Distillery Artfest Toronto. Latin Duo coming to Artfest Toronto at the Distillery! Farrucas Latin Duo will be appearing at Artfest Toronto this Labour Day long weekend! Listen here for a taste of their dynamic and diverse Latin music. On Saturday, Sept 2nd, listen to the dynamic duo Farrucas at the Distillery Historic District ~ a husband-and-wife that experiment with the diversity of Latin sounds and instruments through their music, painting an exotic musical portrait for you to enjoy all year long. Performing from noon to six, the duo is a must see. Show times here: Farrucas at Artfest Toronto. Farrucas Duo’s artistic taste is a “fusion” between two musical traditions: Mediterranean and Ecuadorian, blending together other several genres including Arab, Cumbia, Rumba Flamenco, Salsa, and Rock influences. Between recording new ideas in their studio and performing live at more than 300 shows per year for over 10 years, they deliver the best Latin music in the GTA. With such stunning performances, a variety of instruments, homage to diverse cultures and nationalities, heart-warming albums, and legions of fans, Farrucas Duo is a musical journey you need to experience! Check out the rockin' line up of music here this Sept long weekend! You'll want to get your dancing shoes on and join in on the fun! For a list of their tour dates, visit - Farrucas Latin Duo Tour Dates. See you all at the show! Posted on August 29, 2017 by Lory MacDonald and filed under Artfest Music and tagged Artfest Toronto Artfest Music Artfest Performers Distillery District. Andy Griffiths to rock the stage on Labour Day at Artfest! Andy Griffiths entertains us on Monday with his energetic and passionate rootsy folkin' rock tunes. He writes from gut feelings and personal experiences, sings lead and plays a driving rhythmic/percussive style on acoustic guitar. Catchy melodies and tight vocal harmonies are prevalent throughout his tunes. Posted on August 28, 2017 by Lory MacDonald and filed under Other, Artfest Music and tagged Artfest Toronto Distillery District Music. Aqua to perform at First Nations Pavillion at Artfest Kingston! 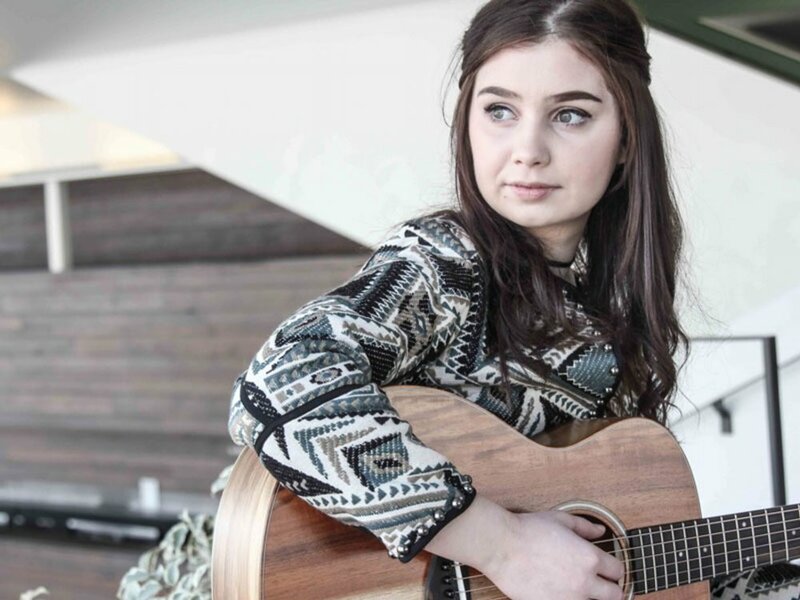 Métis woman of Ojibwe decent and cultural activist and singer, Nibii Waawaaskone, will be performing at Artfest Kingston this Canada Day long weekend. Come celebrate Canada 150 at the First Nations Pavillion and enjoy listening to Agua Music performed by drummer and songwriter also known as Nibii Waawaaskone (Water Flower). Visit Aqua's website - http://aquamusic.ca/ and see you at the show! Aqua is as committed to her individual expression and evolution as she is to giving back and sharing with others. Nibii Waawaaskone works to empower youth and women, is a longstanding facilitator of community drum circles, a partner with several Indigenous organizations, regularly collaborates with likeminded artists, and facilitates cultural workshops across Ontario. Posted on June 5, 2017 by Lory MacDonald and filed under Artfest Music and tagged Aqua Metis Ojiibwe Hand Drummer Artfest Kingston Canada 150. Artfest Line up - Quickly Approaching! Celebrate Canada with Artfest Ontario! This year, we are celebrating Canada's 150th birthday and Artfest Ontario is excited to announce our summer line up of fine art and craft shows featuring Canada's top artists and craft designers! Come join in on the excitement and kick start the spring season at our upcoming Artfest Toronto Show at the Historic Distillery District. The show starts Saturday morning at 11 a.m. and runs daily from 11-6 right until holiday Monday at 6 p.m. Canadian's across the country are celebrating Victoria Day in honour of Queen Victoria and her birthday, which falls on May 24, 1819. Hence why Victoria Day weekend is also known as May 'two-four'. Artfest Toronto is showcasing some of Canada's finest art and craft work by exhibiting over 75 artists/artisans for over 10 years now. Check out our list of outstanding exhibitors here. Set along the cobblestone lanes of the District in downtown Toronto, Artfest will be exhibiting in the perfect setting in celebration of Victoria Day. The Distillery features an exquisite selection of fine restaurants and cafes and is home to a blend of Victorian Industrial architecture and 21st century buildings. Artfest Toronto is a FREE event and hosts children's workshops, live music and a collection of gourmet foods to die for. Check out our rockin' Artfest performers here and our Children's Art Programming here. Get ready, Artfest has a line up of four spectacular art and craft shows this spring, summer and fall! Escape this Victoria Day long weekend and come see us at Artfest Toronto, May 20th to 22nd. Scroll through some of our exhibitors art and craft photos and have a sneak peak at what will be offered at this year's 2017 Artfest Toronto event at the Distillery District! Posted on May 9, 2017 by Lory MacDonald and filed under Artfest Kids, Artfest Music, Other and tagged Artfest Ontario Artfest Toronto Distillery District Canada Day Canada 150 Historic Distillery. Artfest events always present rockin' performances by a selection of talented musicians to enhance the inviting atmosphere for Artfest visitors. We keep the music low-key so not to overpower the art scene, but instead, engage visitors making your visit with us quite memorable. This year at Artfest Toronto, we're opening the show sharp at 11am on Friday with Andy Griffiths and his energetic and passionate rootsy folkin' rock tunes! Andy writes from gut feelings and personal experiences. He sings lead and plays a driving rhythmic/percussive style on acoustic guitar. Catchy melodies and tight vocal harmonies are prevalent throughout his tunes. For the last 30 some odd years Andy has been pursuing his love of music ... writing and recording original music whenever he was able to. Andy performs mostly original shows, feature sets, and open stages which led him to record and release his debut album Looking At Life in 2011. Along with help from many of the incredible musicians he met along the way. This album is a folky-rock album with an honest take on a life well lived. Reviewers have written that Andy's music brings comparison to Tom Petty, Bob Dylan, The Lowest of the Low, John Mellencamp, John Hiatt, Grapes of Wrath amongst others. Other album releases are Mind on Other Things and Stella Started It! Visit - http://www.andygriffiths.ca/. On the Saturday of Labour Day weekend Melody Fair joins us with their beautiful guitar rhythms and sweet melodies. David Wipper has a solid background in recording and concert performance. You will recognize his distinctive style from Grammy Award winning hit song Black Velvet and other hits by Amanda Marshall, Rita Coolidge and Return Trip. Hazel Wipper hails from folk band Jesse and later the Decades and sings gorgeous lead with her partner David in Melody Fair. They perform a wide range of folk and rock classics showcasing David’s stellar guitar skills and Hazel’s amazing voice. Monday September 5th Matt King is performing guitar and vocals on a wide variety of popular tunes. Born into a musical family, Matt started playing guitar when he was 12 and has been playing professionally since the age of 14. He has performed and/or recorded with Scarefactory, Barney Rebel, Midnight Radio, The Funk King Band, Gonzo, Kevin MacLean, Astrid Young, and Harrison Kennedy (appearing on the Juno-nominated “Shame The Devil”). Over the last few years Matt has taken on the role of solo acoustic guitarist/vocalist in The Duo with Scott Apted and is a sideman for a number of local artists in the Greater Toronto Area. Posted on August 11, 2016 by Lory MacDonald and filed under Artfest Music and tagged Artfest Music Artfest Toronto Distillery District Labour Day Music. Creator, Ross Stuart of Rosbilt TinCan crafts a line of groovy handmade musician quality instruments made from discarded tin cans. How cool is that? Drop by his booth this upcoming Labour Day long weekend for a live demonstration. His resophonic tin can banjos, ukuleles, and five string guitars are hand spun resonator cones, with a folded metal headstock and quality steel banjo strings. Ross lives in downtown Toronto and builds these awesome instruments in a little shack in his backyard. He started ten years ago and is now entering his fourth professional year with the rosbilt TinCan instruments. Made from discarded tin cans, these instruments are sure to turn heads while resonating sounds unlike any other instrument. How crafty. Check them out at Artfest Toronto this weekend. Posted on September 5, 2015 by Lory MacDonald and filed under Artfest Music, Other and tagged Banjos Ukulele Artfest Toronto. Friday, Sept 4th, at the Distillery Historic District rock with duo partners, Karina Wipper and John Boswell for the end of year Artfest Toronto show! The talented Canadian performers will rock the main stage from 12pm-6pm with a line up of popular tunes that'll knock your socks off! Karina has worked with renowned producer Terry Brown (Rush), opened for Honeymoon Suite and had airplay on CBC Radio. John Boswell began performing as guitarist in various bands across Atlantic Canada and was nominated for “Best Pop Artist” at the 2003 ECMAs. He has performed on Canada AM, shared the stage with Steve Earle and Tom Cochrane and has had videos aired on Much More Music. Artfest Toronto is the place to be this Labour Day long weekend! With over 75 artists and artisans exhibiting their fine Canadian art, a selection of delectable gourmet food to choose from, singers along the cobblestone lanes and FREE arts programming for children, you won't want to miss it! Posted on September 1, 2015 by Lory MacDonald and filed under Artfest Music and tagged Artfest Music Karina Wipper John Boswell Artfest Toronto Distillery District.